"BidMagic is the best investment we have ever made in our business. Our sales and productivity increased over 100%!" • On your Desktop or in the Cloud! 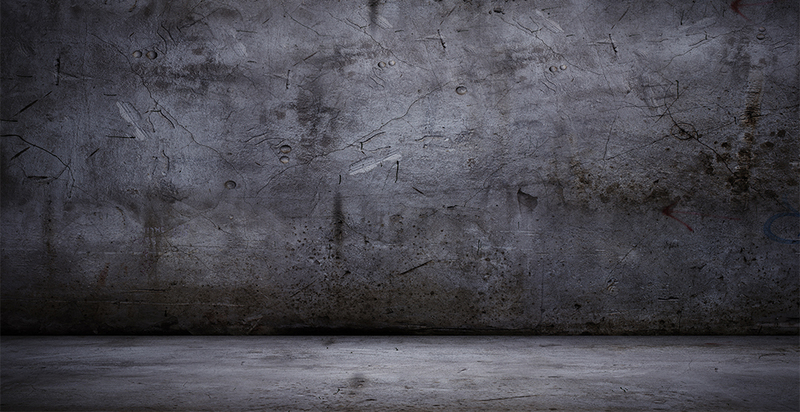 Do Your Business Proposals take too long to create? 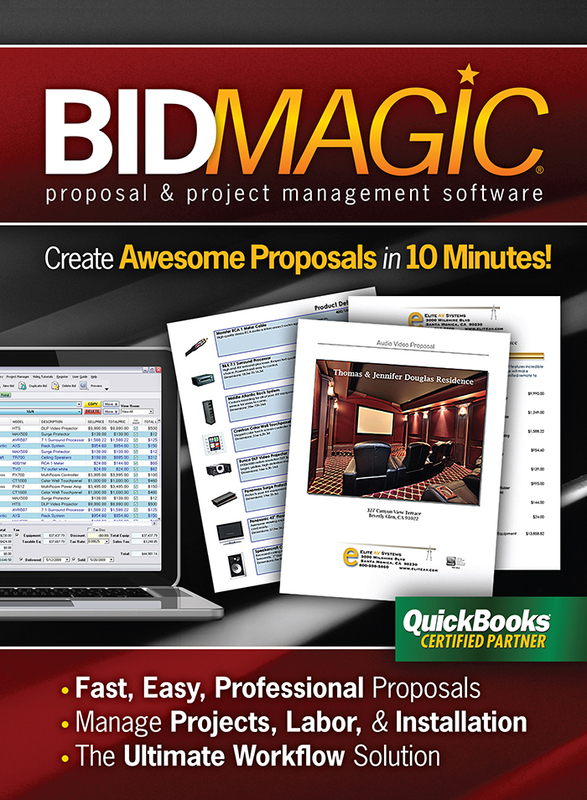 Our proposal software creates $100,000 professional proposal in just 10 minutes. The proposals will blow away your competition! As you automate your sales workflow, the results will be immediate. You will increase your business. This award-winning business proposal software was created by and for custom electronics installation salespeople. If you need power, accuracy, ease of use and great looking proposals this proposal software is for you. Are You Using the Wrong Proposal Software? If you create proposals with DIY spreadsheets – you waste lots of time cutting and pasting. Plus you do not have product management or price controls. If you use accounting software for product management, you cannot calculate labor or create professional looking proposals. Other “Design” programs are too expensive, too complicated, require expensive training, and extended lead time to start up. They are not intended for salespeople. They require additional personnel to run the software. Do You Want a Complete Integrated Workflow Solution? 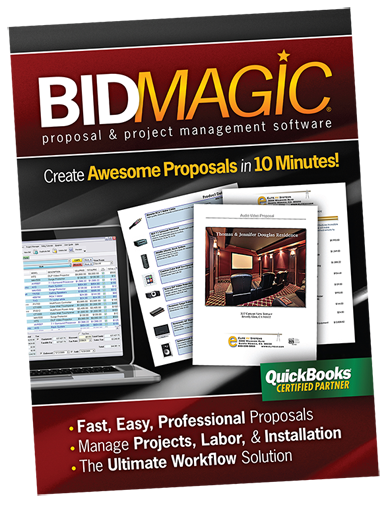 BidMagic combines the top features you need into the ultimate business platform for installing dealers. It can be installed on your PC, server or choose zero installation cloud hosting for easy access from anywhere. Proposals connect to accounting, inventory, project management, service call scheduling, Gantt chart job tracking, mobile time clocks and more. BidMagic combines all the best features you would expect in sales lead tracking, customer management, file sharing, order management and project management into a single, unified workflow. Do You Struggle Keeping Product Info Up to Date for Proposals? You can also import products and prices with Excel spreadsheets from your suppliers. Includes 4 Online Search Engines. Quickly find and download Product Data for 3 Million AV, Security & IT Products! From ADI, B&H, D&H, Ingram Micro, Wynit, Tech Data, Synnex, SED, DSI and more. The #1 source for Commercial AV Products! InfoComm spent 15 years pulling together this incredible Product list. We work together with top industry partners. Keep your products up to date. Dealer verification may be required. Buy it and Try it with our 30 Day money back guarantee.